Pedal Power, a bike store on Main Street, promotes safe but exciting adventures on wheels. Despite being Middletown’s only bike shop, Pedal Power is an exceptional one. Entering the store on Main Street, customers are confronted with row after row after row of bikes, flanked on both sides by displays of helmets and accessories mounted on the wall. At the back of the store is a set of stairs leading up to the second floor, where an additional selection of bikes awaits. Not only is the visual splendor of these bikes impressive—long lines of colorful frames poised to take to the road at any moment—the sheer number is mind-boggling. This diversity of products is part of Pedal Power’s mission, according to Sales Manager Steve Davis (no relation to the author of this article). Pedal Power has been at its current Middletown location for more than 15 years, but the company itself has been around since the late ’70s. It now has two other locations, one in Vernon and one in Essex, and a staff of about 25. However, according to Davis, the company has stayed true to its original goals. 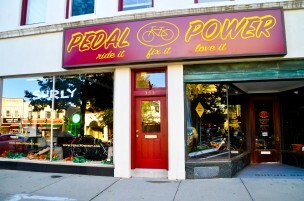 Nonetheless, co-owner Gary Nicol was quick to object to the idea of “selling,” pointing out that Pedal Power’s relationship with its customers is more unique. Fortunately, there are lots of different types of bikes to get excited about at Pedal Power. Their range includes road bikes, mountain bikes, city-town-style hybrids, fat tire bikes, BMX bikes, single-speed bikes, and even unicycles. “You’d be hard-pressed not to find a certain genre of bike in the shop, maybe with the exception of electric bikes,” Davis said. Yet, finding the right bike can sometimes come down to a matter of chance. Most bike manufacturers produce bikes of equal quality, and without a testride, it can be difficult to decide between them. Pedal Power also offers used bikes, which can be a great deal for students. These bikes come from customers’ trade-ins toward new bikes, a system in which the old bike counts as credit toward the purchase of the new one. Still, despite the many used bikes and locks Pedal Power sells to students, the bulk of the clientele is older. “Probably our core demographic, if we were to use metrics and look at all the numbers, is 35 to 55 and married with a couple of kids,” Davis said. One thing that keeps the store’s wide variety of customers coming back, regardless of age and income, is the staff’s friendliness and in-depth knowledge of their craft. Most staff members own at least three or four bikes and are eager to share their passion. This enthusiasm extends to the company as a whole. Each location hosts group rides as well as free classes for new bike owners and paid workshops for those interested in more advanced repair. At the Middletown location, the fall schedule is as follows: on Monday night, there’s a traditional road ride, during which cyclists split off into groups based on speed and skill level. Afterwards, they return to the store for a cookout with food provided by Pedal Power. On Tuesday night, there are two different mountain bike rides, one for beginning/intermediate riders through Wadsworth State Park, and one for intermediate/advanced riders on the trails behind Middlesex Community College. On Saturday morning at 9 a.m., there is a road ride; on Sunday morning at the same time, there is a mountain bike ride. Pedal Power also updates its website and social media to announce impromptu group rides. Naturally, as the days shorten and the weather worsens, these outdoor activities are curtailed. During the winter months, therefore, Pedal Power leads indoor training sessions instead. “Being on an indoor trainer going nowhere can be very monotonous, so at least having other people kind of breaks that up, [makes it] somewhat more bearable,” Davis said. Still, it’s possible to ride outdoors throughout the winter even in Connecticut, according to Davis. The most important repair regardless of weather, however, is fixing a flat tire. It’s the most common repair customers request, but one that every bike owner should learn to do themselves, according to Nicol and Service Manager Spencer Gates. Spencer, who oversees the service shop at the rear of Pedal Power, estimates that the shop works on about 30 bikes a day. The shop’s busiest days are Thursdays, Fridays, and Mondays, while the store overall is most crowded on Fridays and Saturdays. Yet, however hectic the store becomes, there are a few purchases that the store’s managers say are always worth making time for. He added that a flashing light is equally critical.